Duck confit. 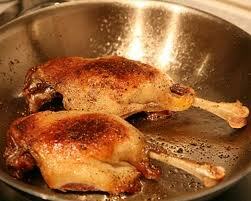 I think anything duck is delicious, and I save a special place for duck confit. What is duck confit? Who cares, all that’s important is that it’s delicious. If you’ve never had it before, my recommendation is to try it as soon as possible. Its taste is unique, but if you had to compare it to something, I would compare it to the most tender and flavorful part of roast turkey. But better. Much better. It’s rich, moist, succulent, savory, and pairs so well with so many winter items. Served hot or cold, broken down into rilettes, or simply served as simple as possible, it’s good. Really good. So really, what is it? To process something en confit is to preserve it. It’s an ancient preservation method that produces unbelievable meat. Similar to Prosciutto de Parma: ancient methods of curing and preserving meat are still in use today. Duck legs are cured, cooked in their own fat with a variety of herbs and aromatics, until fall-off-the-bone tender, and then stored in the same fat until ready for consumption. The brine ‘sterilizes’ and partially de-hydrates the meat, cooking it obviously completes the process, and storing it in the fat protects the meat from air and any pathogens that may be thus transmitted. But the flavor and texture… it’s like nothing else. A lot of chefs will do turkey leg confit, guinea hen confit, and so on, but nothing works like duck. Is it healthy? Really, it’s not a question we should ask of something so good. Enjoy the succulent and delicate flavor, it’s a once in a while delicacy, to be enjoyed without guilt. Producing it takes a little work, but once you try it, you will understand, it’s worth the effort. On a side note, this can be made with turkey legs, cornish game hen, goose, or any other slightly gamey or tougher bird. Using a spice grinder, grind the pickling spice until it’s a powder. Mix the pickling spice with the ginger, 1/2 bunch thyme, salt and sugar. Cover the duck legs completely in the cure (mixture), cover, and refrigerate over night. The next day, wash the duck legs well. Let drain and dry at room temp. In a large heavy skillet, heat the butter until foaming. Sear the duck legs, both sides, until deep golden brown. Deglaze the plane with the brandy and reduce by 2/3. Reserve everything in the pan. Heat an over to 300 degrees. Place the duck legs snuggly in a heavy roasting pan (pan should be just large enough to fit the legs). Place the thyme, peppercorns and garlic on top of the duck. Pour the duck fat and reserved pan drippings over the top until just barely submerged. Cover the entire pan with an even layer of sliced onions. Place the pan in the oven for 2 hours. Turn the heat down to 250 and cook for another 2 hours. The legs should be incredibly tender, but not quite falling apart. Let cool to room temp. Remove the legs and strain the fat. Keep the garlic, discard everything else. Save the fat (the fat is seasoned, and can be kept for years). The confit is now down. Either recrisp the skin and serve whole, or pick the meat and use in a variety of other dishes.